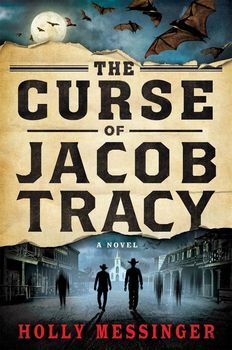 St. Louis in 1880 is full of ghosts and Jacob Tracy can see them all. Ever since he nearly died on the battlefield at Antietam, Trace has been haunted by the country's restless dead. The curse cost him his family, his calling to the church, and damn near his sanity. He stays out of ghost-populated areas as much as possible these days, guiding wagon trains West from St. Louis, with his pragmatic and skeptical partner, Boz. During the spring work lull, Trace gets an unusual job offer. Miss Fairweather, a wealthy English bluestocking, needs someone to retrieve a dead friend's legacy from a nearby town and she specifically wants Trace to do it. However, the errand proves to be far more sinister than advertised. When confronted, Miss Fairweather admits to knowing about Trace's curse and suggests she might help him learn to control it in exchange for a few more odd jobs. Trace has no interest in being her pet psychic, but he's been looking twenty years for a way to control his power and Miss Fairweather's knowledge of the spirit world is too valuable to ignore. As she steers him into one macabre situation after another, his powers flourish and Trace begins to realise some good might be done with this curse of his. But Miss Fairweather is harboring some dark secrets of her own and her meddling has brought Trace to the attention of something much older and more dangerous than any ghost in this electrifying and inventive debut. A brilliantly crafted, fast-paced historical fantasy set in the rich world of the American West, introducing an unforgettable new hero, Jacob Tracy a Civil War veteran who can see ghosts.